A visitor to SP inspires Mr. Loadlink’s latest blog about minding your own business, applying for grants, and education. He also looks forward to another busy trade show season. 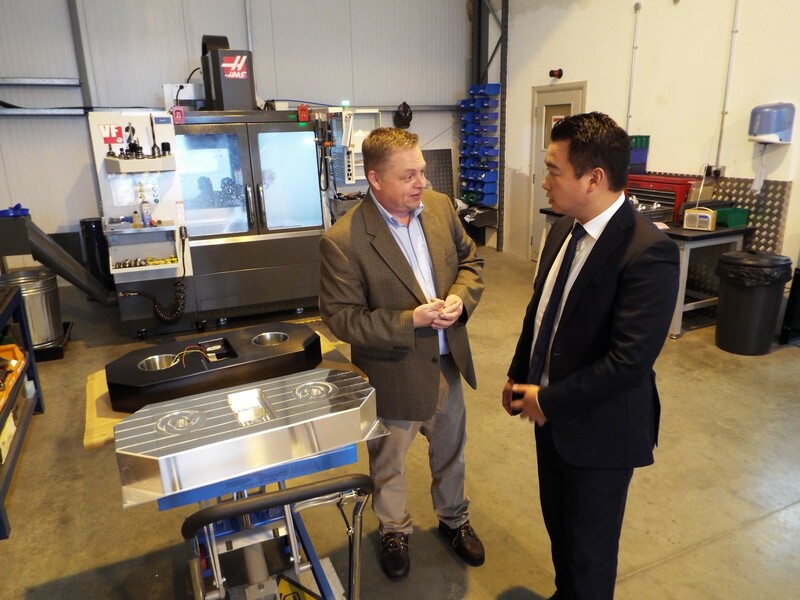 I showed Alan Mak, Member of Parliament for Havant, around our Havant facility and new machine shop. 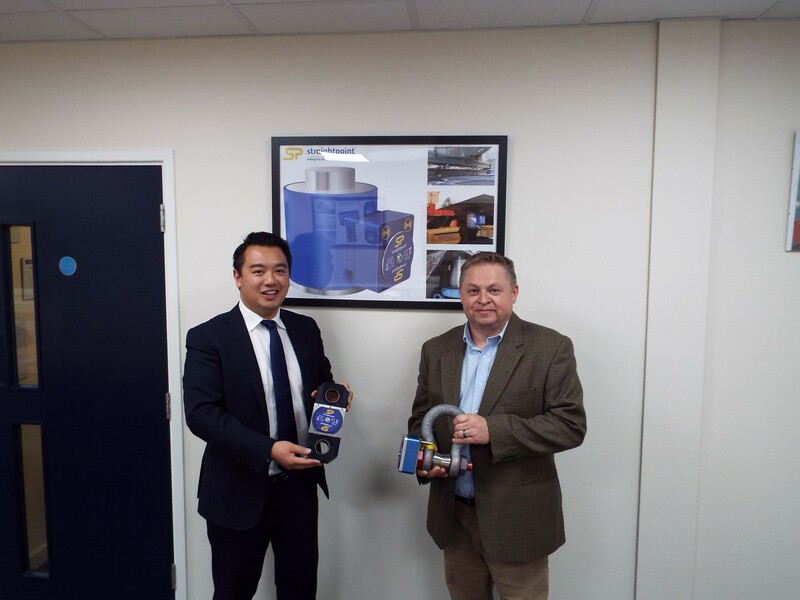 Mr. Mak was keen to get his hands on SP equipment. Mr. Mak with SP’s (left to right) Josh Young, Josh Chipps, Gary White and myself. Alan Mak with me and Marcus MacDonald last week. It struck me how important each of them is to small and medium-sized enterprises (SMEs), indeed, any business. Few things put a place on its toes faster than a high profile visitor. Remember when you were at school and the head teacher said at assembly that the chairman of governors or, worse, Ofsted inspectors would be visiting classrooms? Uniforms had to be pristine, behaviour exemplary and manners impeccable. Mr. Smith might as well have said, let’s make the place look and feel as different as possible from a normal day! A good yardstick by which to measure a business is to what extent the same needs to happen when a visitor—an MP, for example—arranges an appointment. This blog isn’t about SP per se but, other than a couple of tweaks here and there, our ducks (load cells) were already in a row. If a memo needs to go out about punctuality, not eating at workbenches, smoking, chewing gum and addressing people in a professional manner, there needs to be a rethink. It goes beyond aesthetics. A visitor is certain to ask questions; it’s the most efficient way to demonstrate interest and guard against awkward silences. How many people work here? In what roles? Who is the longest-serving employee? Do you employ apprentices? What does this machine do? Where is that product going? Etc. Most CEOs and employees should be able to answer these questions standing on their heads, but what if the visitor digs a bit deeper? Does the company have an environmental policy? Does it contribute to local business groups? Do you believe in the value of networking? At what end of the market do you compete? What is the state of UK manufacturing? If a visitor is trying to trip people up, they will find a way of doing so, but in the main they ask questions because they are interested and want to give the business they’re calling upon a chance to talk about itself. If the hosts stare blankly into space in response, it’s another good indicator that better education (we’ll come to that), systems and policy should be in place. Leave room for interpretation, however, and allow individuals to shine. Mr. Mak probably got the memo from Conservative Party HQ titled, ‘Strong and Stable’, during the latest election campaign. Businesses shouldn’t look and feel like political parties, but nor should they resemble a youth club. A visitor should leave with a clear understanding of what a business does and what it stands for. In the case of an MP, they should feel comfortable to keep the lines of communication open and involve the business in future initiatives. Mr. Mak asked us if we would participate in upcoming business breakfasts he was supporting, which I took as a good sign. This is a staggeringly overlooked area by businesses of all sizes, but particularly SMEs. Let’s tell it like it is: there is government money out there that companies can apply for to buy stuff or invest in things and people. Ok, it involves more than knocking on the door of 10 Downing Street and holding out one’s hand, but the principle is literally that straightforward. And it’s not only a case of getting £100 for new company t-shirts. No, serious cash is available if a business is prepared to adhere to the process and demonstrate how they could spend it wisely. 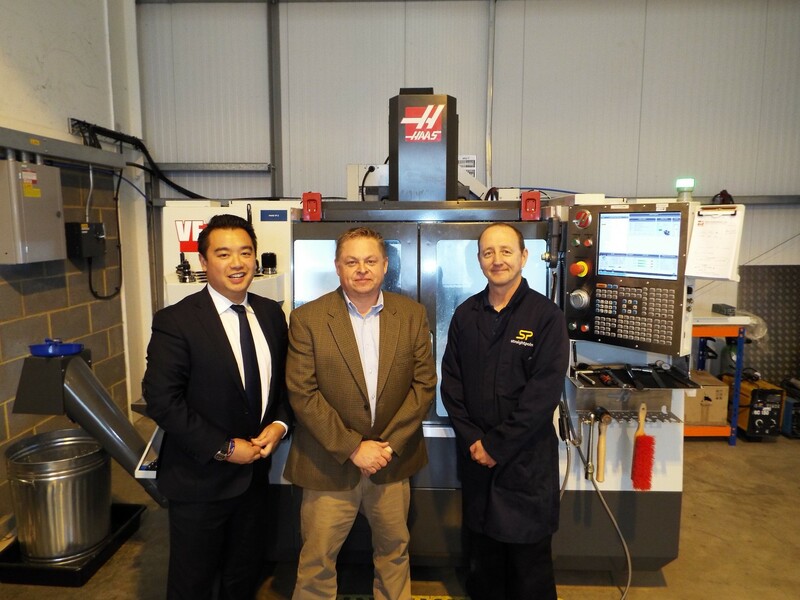 SP has recently secured its second significant grant, which we used to kit out the new unit with a VF-2 CNC (computer numerical control) milling machine, TL-1 CNC lathe, Bridgeport manual turret mill, Colchester chipmaster lathe, Sealey band saw, hydraulic press, and more. In fact, it was the funding that led to Mr. Mak’s secretary giving us a call and asking to have a look around to see what we’ve done with the money. The equipment joined our new load cell testing machine that was also purchased through grant funding. Richard Woollett, SP’s financial controller, has become something of an expert in securing grants. He achieved the latest funding through the Havant Business Support Fund, a government local growth initiative, in partnership with Solent Local Enterprise Partnership and Portsmouth City Council. Richard explains that the process involved a lengthy application form, a business plan, three years historical figures, and a three-year financial forecast. Last year, we also received smaller grants for apprenticeships and consultancy. If you’re in the Solent area, there’s your starting point, but there’ll be a similar scheme near you that can be found with some simple online research. As Richard will agree, it isn’t easy to get the money, but it is possible—and worth it. The first step is identifying a need for funding, whether it is new kit, apprentices, training, expansion, or something else. It’s probably the case that a business already has a long list of investment opportunities but hasn’t advanced them because of the lack of capital. Next, it’s a case of making a positive decision to apply for funding, assigning someone to oversee the process (like Richard) and sticking to it with the same tenacity and passion that makes it a successful company in the first place. Grant processes take various forms (sometimes literally). I remember when my business partner, Peter McGreal, and I had to stand before a panel and outline a business plan for acquiring the new test machine referenced above. If you find yourselves in the same boat, prepare for questions: Why do you need a new machine? What will it be used for? How often will it be used? How will the purchase lead to increased revenue and jobs? Will the machine open up doors to new markets? Will it allow you to be more competitive? Work on the answers and sell the concept. In most cases, the people holding the purse strings will want to offer up the cash but they need to tick the boxes; needless to say, the government isn’t in a position to waste money. Make your business the soundest investment they’ve ever made! Training and education is an SP cornerstone, as regular readers of this blog know. As we discussed with Mr. Mak, it’s also been a focal point of grant funding in the past. I’d struggle to find common ground with any business leader who couldn’t see the value in applying for funding to train, educate, uplift, engage and retain people. It’s hugely rewarding to watch a team grow together and introduce new personnel, as growth of the company requires more resources. This is arguably the component of business most suited to grants. A firm might proceed with its expansion plans, acquiring the space and kit to do so, as a matter of course. CEOs, finance guys and senior management will probably see the benefit of expanding to make more money. Yet, training and education can often be met with negativity. What do we get back? What if people take the skills and go elsewhere? Can’t we spend the money on something that makes more money? They’re all questions that have been tabled at board meetings up and down the land. I accept that it wasn’t always my plan to invest as much time and energy as we do on staff training so I remember what it’s like to be further down the curve. Regardless, I’m now a massive advocate for it and implore businesses to train their people. Perhaps grant funding is the single best way to get such investment approved. Once the results become apparent, even the most cynical of CFOs will see the value in it. They might even reserve a big chunk of the next budget for a day of emotional intelligence speeches. Ok, one step at a time. Seriously though, training works. We’ve even added it to appraisal agendas, asking staff: What training have you been exposed to over the last six months? Was it useful? What content did you find redundant? How has it benefitted your work? Would you have welcomed additional training? If you could tailor a day of training content, what would be on the list of topics? How many Action Coach (our coaching provider) sessions did you participate in? Will personal enrichment make you more or less likely to stay at SP for the long term? As an aside, that book is about comparing businesses to pumpkin farmers who develop and nurture their biggest pumpkins to make fat, juicy, glowing orange, award-winning fruits. It aligns with the theory that all businesses have A, B, C, D… list clients and they should all want more of the best kind. It’s just one of a multitude of books out there. If you’re new to this kind of text, start with ‘Start With Why’, by Simon Sinek. Why? You’ll see. We’re on the cusp of another trade show season that starts for SP at SPE Offshore Europe 2017, which takes place at the Aberdeen Exhibition & Conference Centre in Scotland on 5-8 September. It’s an exciting way to kick-off another events campaign as this is the first time we’ll take exhibition space at the biennial show, having launched a full range of ATEX and IECEx products since the last time it was held at the same venue almost exactly two years ago. Look out for a subsea load pin that we recently manufactured, and whether you’re a social media fanatic or not, it’s worth monitoring the #OE17 hashtag on Twitter, which is among the most vibrant online show networking platforms of all the events we go to. A trade show in Australia follows shortly afterwards before Seatrade Offshore Marine & Workboats Middle East in late September, where I’ll team-up with the Rigmarine guys. In the meantime, we’ll have representation at LEEA’s final roadshow of the year in Bristol on 20 September before the association’s flagship annual event, LiftEx, which this November takes place in Telford. In between the LEEA events, Associated Wire Rope Fabricators (AWRF) stages its 2017 Fall General Meeting and Product Information Exhibition (better known as PIE) towards the end of October. And that’s to name just a few events in the SP diary! If you see us, please say hello. As Mr. Mak will testify, we make great hosts and we know our areas of expertise inside out.